Do not click on Ads by Allgenius because they may be unreliable. The pop-up and banner advertisements presented by the extension usually present the offers of third parties, and trusting them could be quite risky. All in all, the ads and offers presented by the advertisement-supported program should surprise most users because it is unlikely that most will know how the application works. Unfortunately, the program is not represented in an official manner, and computer users download it bundled with other applications. Needless to say, Allgenius is not the initial program people choose to install, and it is simply attached to other potentially undesirable programs or other adware. Luckily, you can remove Ads by Allgenius. The developer of Allgenius (SuperWeb LLC) is notorious for using the software bundling technique for the distribution of ad-supported programs. Other unreliable applications created and distributed by the company include the recently discovered Glomatron, Raving Reyven and HypeNet. These applications are not available officially, so you should not be surprised to discover that the download link on allgenius.info is inactive as well. You also should not be surprised to find the application attached to the installers of other software. If you complete the installation of the extension, it is likely that you will twist your head thinking how to delete Ads by Allgenius soon enough. Note that the removal of this adware is truly important. Besides presenting irritating and potentially misleading ads which may belong to suspicious third parties, Allgenius can also disrupt your web browsing. What malware researchers have faced is the sponsored search results linked to TopicTorch search engine and easy-access links to popular websites. This activity is usually related to the Google search engine; however, others could be affected as well. Overall, if you notice suspicious online ads and other suspicious symptoms, you should delete whichever program is causing this. 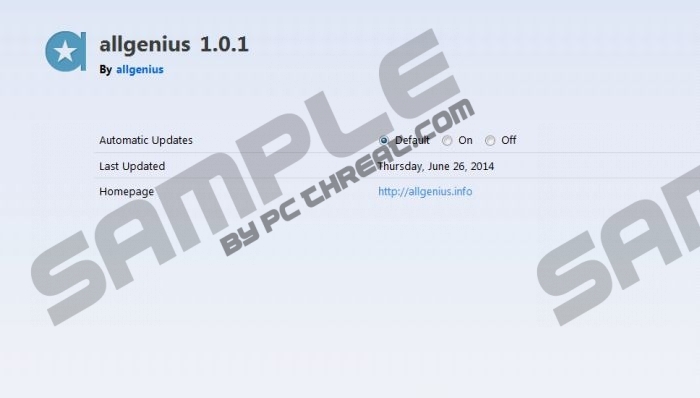 Continue reading to learn how to delete Ads by Allgenius from your browsers. The advertisements linked to adware are usually removed when you delete the unreliable software. Use the guides below to delete Ads by Allgenius manually. Note that automatic malware removal software should be installed even in case the removal of advertisement supported software appears to be successful. If you miss certain adware components which are not easily detected, the disturbing ads may reappear in the future. Click the download button below and install a legitimate security tool which will delete all threats and all of their components in no time. Select and Remove the unwanted application. Right-click Allgenius and select Uninstall to delete it. Quick & tested solution for Ads by Allgenius removal.